Photos ripped from the New York Times. Many many articles have been written about this. Here is just my brief rundown, with some references. Obama does much better with young voters, aged 18-35. Now I don't know if they know him any better than I do, but they have taken to him much faster than I did. Was it Facebook? Was it his rock star appeal? I don't know. But his energy resonates with the young. Clinton does very well with Asian and Hispanic voters. Why? Her campaign establishes relationships the old fashioned way - by meeting with local Asian and Hispanic politicians and community boards and answering their questions straight. Obama's camp didn't do this. Also, as Jeff Chang writes, it is a fact that Asian and Hispanic Democrats tend to be more conservative than white and black democrats. It could be a variety of factors, including religion (Hispanics tend to be active Catholics, many Korean-Americans are active Protestants, etc.). Chang calls more conservative Democratic candidates (like Clinton) "emergents," while more liberal, progressive candidates (like Obama) are labelled "insurgents." Clinton also dominates among female voters over 40 years old. While Obama does exceptionally well among white males, many of whom consider themselves independents. Clinton has shown an ability to lock-down union endorsements early and swiftly. She has built mainstream support the old fashioned way. She also likes small discussion groups a lot. 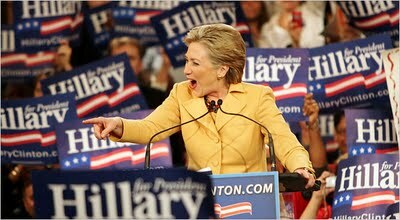 While they don't create excitement like Obama's rallies, they seem to have made her a more sincere candidate. She still hasn't given me a reason to vote for her, but for others, she has answered their questions and has won their support. Obama does extremely well in more rural ('red') states. He has won Alaska, Kansas, Utah, and Alabama, among others. His next big test is Texas. If he wins that, he is looking good for the nomination. But there is a large amount of Mexican-Americans in Texas. So it is a real test. But at the same time, Obama does very well among white, college educated progressive voters. It's quite a feat - to appeal to both the rural working class and the wealthy voters with master's degrees. The Connecticut victory is a huge breakthrough. We knew that Obama would do well in cities like New Haven, Hartford, and Bridgeport, where there are large black populations. But he also got scores of votes in Old Saybrook, Darien, Norwalk, and Stratford. Back in August, when my aunt and uncle in Stratford told me they were voting for Obama, I knew he would win Connecticut. The near-defeat of Lieberman by Ned Lamont in 2006 was also a hint that Connecticut had more progressives than it did in decades past. David Chen of the NY Times writes about this today. Compare Obama's win in Connecticut to Clinton's sound victory in New Jersey. You would think that Obama would also win New Jersey because of its large black population and diverse working-class towns. But no. The wealthy classes in Hoboken (which includes Governor Corzine) went for Hillary. While Princeton, Trenton, Atlantic City, and Newark were wins for Obama, Hillary carried the solid New Jersey middle class, i.e. two income families, espcially whites, Hispanics, and Asians. But get this - Obama won three rather different counties in New Jersey. He won Hunterdon, a very rural area of villages in the northwest corner of the state. He won Atlantic county, which includes Atlantic City. And he won Essex county, which includes Newark, Orange, and the wealthy suburb of Montclair, where 60% of the inhabitants are white and earn more than $40K each. (It's also the home of Yogi Berra...had to mention that). Even if we assume Clinton won Montclair, Obama was showing signs of winning New Jersey over. But Connecticut opened-up to him much faster and with more enthusiasm. Interesting differences for two wealthy states that have large populations of older Democrats, young college students, working class families, and black and latino urban residents. The NY Times has an excellent story today adressing the differences in the New Jersey and Connecticut results. Overall, Obama won some big, general election swing states: Colorado, Missouri, Minnesota, and a tie in New Mexico, where they may still be counting votes from the 2004 election. All will be crucial in deciding the next president. His victory in Colorado, by a 2-1 margin, defied most predictions. Four times as many Democrats turned out as were expected, typical of the passion level elsewhere. In Anchorage, Alaska, for example, traffic was backed for nearly a mile from people trying to get into a middle school to become part of an Obama avalanche. ...Now broaden the picture and look at the vote among white males, traditionally the hardest sell for a Democrat. While losing California, Obama won white men in the Golden State, 55 to 35, according to exit polls, and white men in New Mexico, 59-38. Looking ahead to Saturday, when Washington State, Nebraska, and Louisiana hold contests, Obama should add another three states to the 13 he won on Tuesday. They’re all caucus states, each with distinct advantages for Obama. So back to my neck of the woods. Connecticut's population is less than half of New Jersey's, and it is more white-collar. New Jersy is more working class overall, but has a bigger, more diverse middle class, and has bigger cities. It was a fascinating vote split. Expect Obama to sweep the three caucuses on Saturday. And then he and his people can focus on Ohio while at the same time try to be competitive in Texas.